Accounting and bookkeeping tasks are one of the most important aspects of any business. But, these tasks are also highly time-consuming and extremely complicated. If not efficiently managed, mishandled or wrongly executed, accounting activities can have a negative impact on your business. Due to the significance of these tasks, outsource accounting can help you focus on your business while your bookkeeping partner will take care of your accounts. In this article, we will explore the need for outsourcing accounting in India in detail. Why Should You Outsource Accounting in India? Expert Services : Outsourced accounting paves an easy way to acquire expert services. Without outsourcing, it is difficult for small and medium businesses to hire multiple resources for their accounting and bookkeeping. However, by outsourcing these activities, it is possible to achieve quality services by a team of experienced professionals. Cost-Effective : Hiring resources will increase payroll responsibilities, and paying salaries along with employment benefits can be a burden. Outsourcing accounting and bookkeeping can save you 40% to 50% of money spent on resources, technology, and in correcting mistakes. Time-Effective : Handling accounts and books manually take up a lot of time, which can be utilized in other important business activities. If you outsource accounting in India, you can easily shift your focus to the essential business processes. Scalability Option : You can always scale and cut-down in a blink. An expert team by your side will also aid to broaden your horizons any time. Your outsourced accounting partner will come up with feasible plans and help you through the milestones. What Accounting and Bookkeeping Services Can You Outsource? I wish someone could look at my accounts. I think we should hire a resource to look after accounts and books. When such thoughts cross your mind, instead of hiring a resource or dedicating extra time to accounts and books, outsource accounting instead! Here are some key pointers to determine when you should choose outsourcing accounting in India. Are you unable to complete accounting and bookkeeping activities on time? Is it confusing to handle accounts and books? Do you feel your accounts and books can be improved? Do you think you are not managing essential business processes because of your indulgence in accounting activities? Are you unable to achieve correct financial advice for making intricate business decisions? Finding the Right Outsourcing Partner! Finding the right outsourcing firm is the key to a great partnership. For you to shed your responsibilities and rely on your outsourcing partner for detailed insights, you should be able to trust this firm with your data. Hence, while outsourcing accounting, understand the security structure used by the outsourcing partner to make an informed decision. Next article5 Essential Points Every Individual Needs to Know about High-Risk Life Insurance Policies!! 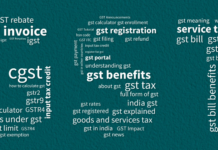 How to Register for GST and How to Obtain GSTIN Number?